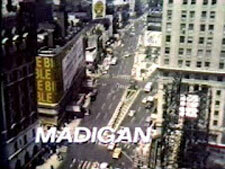 Madigan: Mystery and Suspense on Television. Richard Widmark stars as NYPD Detective Sergeant Dan Madigan in this crime drama, one of the rotating series during the 1972/1973 season of the NBC Mystery Movie. Of the six episodes that aired — all included the word "beat" in their titles, as in "The Midtown Beat" — only three took place in Manhattan; the others were set in London, Lisbon, and Naples.